Learn with Our Trainers Click to learn more! An E-Collar is a remote dog training system that usually consists of a wireless remote and a wireless receiver. E-collars allow you to remotely send signals to your dog to help them understand "good behavior" and "bad behavior." The different E-collar models you can select from have functions that allow you to send either a tone, vibration, or a stimulating sensation to the dog. Why Are E-Collars Better for Your Dog? Unlike most traditional "shock collars" our E-Collars use a form of stimulus that targets the neck muscles of the dog; mimicking the loving touch of their mother. With stimulation levels ranging from 1 to 100, our E-Collars allow you to adjust the stimulation to a level that is best suited to gently communicate with your dog. This “best level” can be locked to prevent over-stimulation and easily adjusted for a higher distraction environment when necessary. This level of control gives our electronic dog collars the clear advantage. The choice is clear: When it comes to getting the best dog collar for training your dog, without applying too much stimulus, then an E-Collar Remote Dog Trainer is the choice for you! Are you considering which dog training collar IS BEST? Do you need bark collar functionality? No bark collars differ from remote dog trainers. How many dogs are you training? 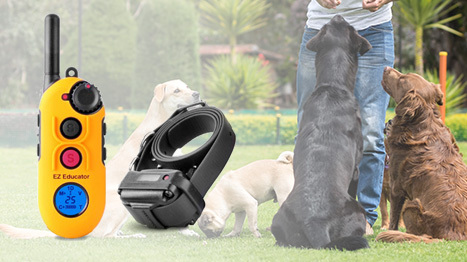 Some dog training collars feature multiple receivers, so you don't need to carry additional remotes. Do you need waterproofing and shock resistance? Don't worry, all of our dog training collars are shock resistant (up to 5000 G-force) and water resistant (up to 500' below sea level). Simply put, our superior construction, durability, and features make E-Collar Technologies' products the best dog collars available on the market today. The term "shock collars" for some, has a negative connotation. Many people incorrectly assume that shock collars cause physical harm or lasting damage to a dog as a form of punishment. This couldn't be farther from the truth. Electric collars are designed to get your dog's attention, not as a form of punishment. When used in combination with positive reinforcement, E-collars provide the feedback that dogs need to learn when to pay attention to the handler. E-collars do not burn or cause lasting damage to a dog. Our educational videos and guides can help to dispel some of the myths associated with dog shock collars.